As if Wheaton needed another Salvadoran joint. But Rios Taqueria y Pupuseria (2302 Price Ave., but really on Fern), open less than two weeks now in the former Suporn Thai strip mall space, turns out to be a hidden gem. Imagine if they raise their game as they go along, like many restaurants do? You can tell a lot about a Salvadoran restaurant by the pupusas, and Rios makes a good one: relatively light and fluffy with a minimum of grease (you’ll never completely eliminate grease from a flavorful pupusa), good masa flavor, and a perfect dough-to-filling ratio. Overall well above average, and may challenge Intipuqueno for best in Wheaton. $1.75 apiece, standard for pupusas around here. Also standard, Rios serves pupusas with curtido, a (yellower-than-usual — turmeric?) vinegared cabbage slaw, and a thin, not-spicy tomato salsa; both are fine. The real value, though, is in the tacos. 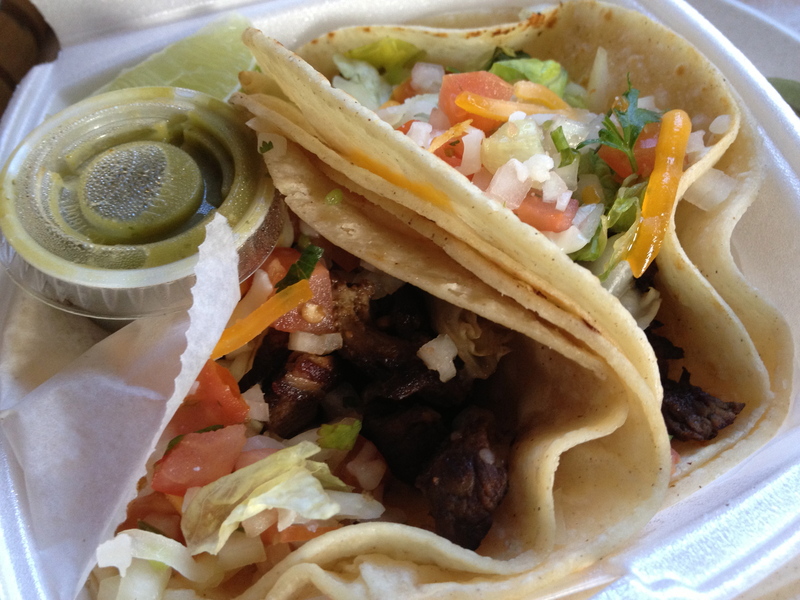 Two tacos with charred meat (the carne is excellent; they also offer chicken and beef tongue), onion, tomato, lettuce, cilantro, and a sprinkling of cheese, all in good balance, double-wrapped in soft, warm corn tortillas…for $2.50. That’s $2.50 total, not per taco. That would be a decent deal even if the tacos were only okay, but they’re really good! They come with a little cup of sneaky-hot green salsa on the side. Fresh ingredients, well-cooked meat, high quality tortillas. Love it. The rest of the menu has the usual Salvadoran specialities, with only an occasional nod to Mexican cuisine. Lots of grilled steaks, seafood, fajitas, all in the $8 to $15 range. The tacos may be the craziest value, but I suspect there’s good value elsewhere on the menu too. I look forward to trying more. There isn’t much decor, though the salmon/red paint is nice enough, and the tables are swathed in red fabric and topped with cute flower arrangements. Might be a cozy space, if it were full, but so far I’ve only seen it empty and that’s decidedly un-cozy. Looks like they may offer a buffet sometimes. Staff seems friendly. All in all, Rios is a promising restaurant, and if the other food is as good as the tacos and pupusas, they should show up on every Best Cheap Eats list in the area later this year. Assuming they can stay in business long enough. Wheaton’s own Irene’s 3 (11300 Georgia) hits the bigtime today with a positive mention in the New York Times’ Frugal Traveler column featuring “cheap, kid-friendly eats in Washington, D.C.” The four and seven-year olds both enjoyed Irene’s pupusas, plantains, and beverages. After tasting the tamale, though, four-year-old Grady said: “it doesn’t sound so good.” Either the kid has synesthesia, or he needs some work on which sense is which. Either way, pretty funny, and great publicity for Irene’s 3 (not to be confused with the much smaller and less boisterous Irene’s Pupusas, around the corner on Georgia, also serving good pupusas) (there is no Irene’s 2). I find I3 too loud sometimes, but the food is authentic and good, and so is the service (knowing some Spanish is helpful but certainly not essential). The peewee culinary crusaders also try Virginia Vietnamese and DC Ethiopian, Bolivian, and Guatemalan cuisine — and Ben’s Chili Bowl, a category unto itself.